PowerApps activities are now tracked from the Office 365 Security & Compliance Center. Office 365 tenant administrators reach the Security & Compliance Center by navigating to https://protection.office.com. From there, the Audit log search is found under the Search and investigation dropdown. 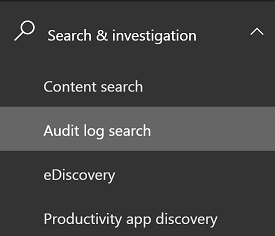 Within the Audit log search screen, tenant administrators can search audit logs across many popular services including eDiscovery, Exchange, Power BI, Azure AD, Microsoft Teams, Dynamics 365 for Customer Engagement apps, and now Microsoft PowerApps. Once the Audit log search screen is accessed, an administrator can filter for specific activities by pulling down the Activities dropdown. By scrolling down the list, a section dedicated to Microsoft PowerApps activities can be found. Logging takes place at the SDK layer which means a single action can trigger multiple events that are logged. The following are a sample of user events you can audit. Schemas define which PowerApps fields are sent to the Office 365 Security and Compliance Center. Some fields are common to all applications that send audit data to Office 365, while others are specific to PowerApps. The Base schema contains the common fields. Result Status Edm.String No Status of the row logged. Success in most cases. Organization Id Edm.Guid Yes Unique identifier of the organization from which the log was generated. You can review your audit data in the Office 365 Security and Compliance Center. 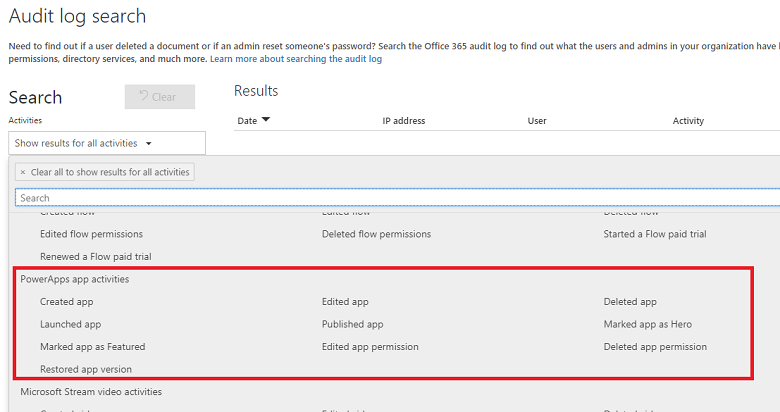 See Search the audit log for user and admin activity in Office 365. To use the preconfigured PowerApps reports, go to https://protection.office.com > Search & investigation > Audit log search and select the PowerApps app activities tab.